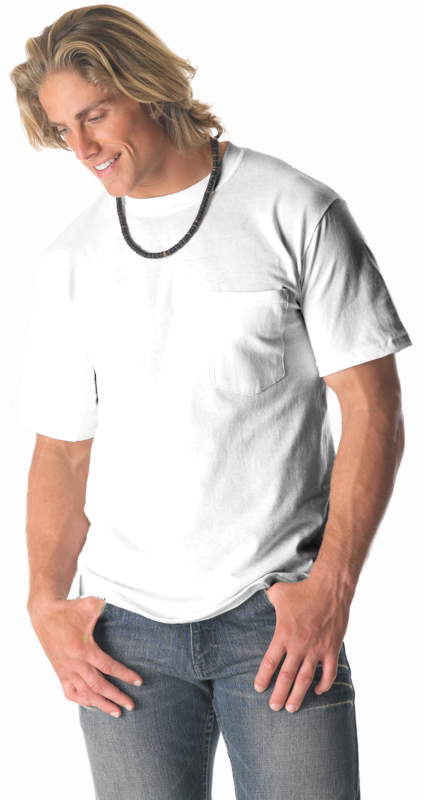 - Gildan® Adult 6.0 Ounce Ultra Cotton® T-Shirt With Pocket. - As in style 2000, with left chest pocket. Gildan® Adult 6.0 Ounce Ultra Cotton® T-Shirt With Pocket. As in style 2000, with left chest pocket. 6 ounce, 100% cotton pre-shrunk jersey knit. Double stitched seamless collar, taped neck and shoulders. Quarter-turned body. Double needle sleeve and bottom hems. Classic fit. Tear away label. Sizes S-5XL: Neutral: White. Heathers: Ash Grey (99/1), Sport Grey (90/10). Colors: Black, Charcoal, Forest Green, Light Blue, Maroon, Navy, Orange, Red, Royal, Safety Green** (50/50), S. Orange (50/50), Sand. **ANSI/ISEA 107-2010 High Visibility certified for use as background material.